Kasparov is currently in South Africa, setting up his Africa’s branch in South Africa, called KCFA – Kasparov’s Chess Foundation Africa. Whilst in South Africa, he played some chess too. 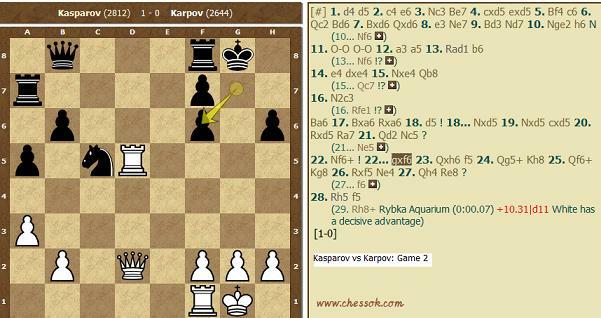 Very proudly, a South African boy draws vs Kasparov. Read about this young lad. 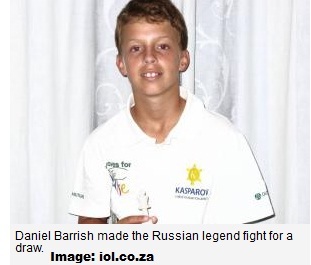 This is fantastic for such a young boy – that shows the potential amongst the South African chess players. I see another Chess Grandmaster-in-the-making for South Africa! Well done to Daniel! You made us proud! 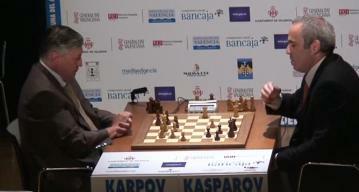 Kasparov was the one who offered Daniel the draw. Here’s the game. ONE of the greatest chess players of all time, former world champion Garry Kasparov, met his match yesterday in Khayelitsha where he was held to a draw by an 11-year-old Cape Town pupil, Daniel Barrish. Kasparov was in Cape Town to promote a joint venture between his foundation and a local NGO providing local chess-based mathematics and science programmes aimed at under-privileged children. Yesterday the Russian played simultaneous chess matches against 25 young people in Khayelitsha. After going toe-to-toe with Barrish for three hours, the international chess grandmaster surrendered to the Grade 6 SACS pupil. Speaking to the Cape Times from his Constantia home, Barrish said it had been an honour for him to play Kasparov. “I was very happy that I was going to play him, even more that I drew with him. I was nervous and thought I was going to lose. He made a couple of mistakes, he was moving too fast and I capitalised. He had to fight for a draw,” the 11-year-old said. Barrish, a three-time under- 10 national chess champion, has never conceded a defeat in his age group. 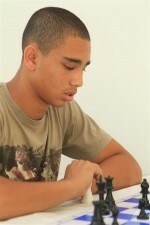 He also won the African chess under-10 championship and is the youngest in the Springbok chess team. 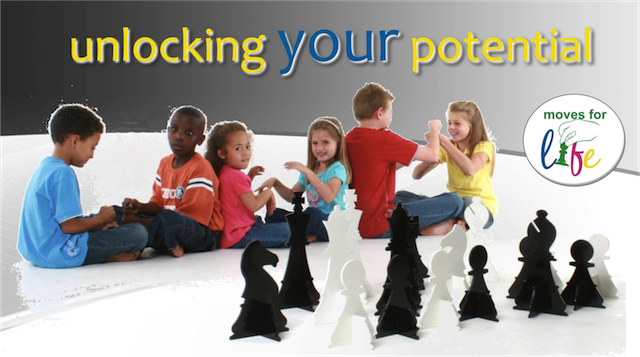 While in SA, Kasparov’s foundation, Kasparov Chess Foundation Africa (KCFA), will work with Moves for Life (MfL), a local chess-based mathematics and science programme aimed at under-privileged children. Last night Kasparov played head to head with 16-year-old South African chess champion Marcel Roberts at Table Mountain’s lower cablecar boardroom, when strong winds stopped them from playing on top of the mountain. 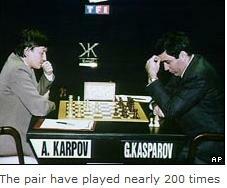 Kasparov and Roberts played two short five-minute games. President Jacob Zuma, patron of MfL, will today meet Kasparov to celebrate the opening of Kasparov’s Africa branch of his foundation. 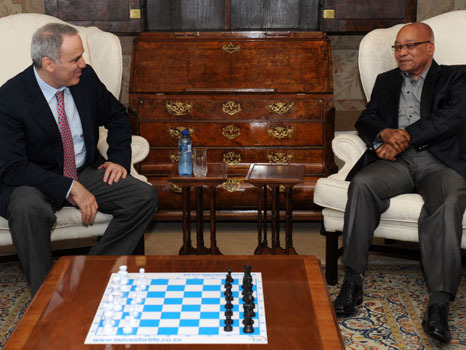 Please click HERE for an Afrikaans news article and HERE for iol’s article – both about Kasparov’s visit. HERE and also here. You can see Mr Spock playing chess in Star Trek here. See two more edited images of ‘Flash’ Karpov here on my blogger-blog. 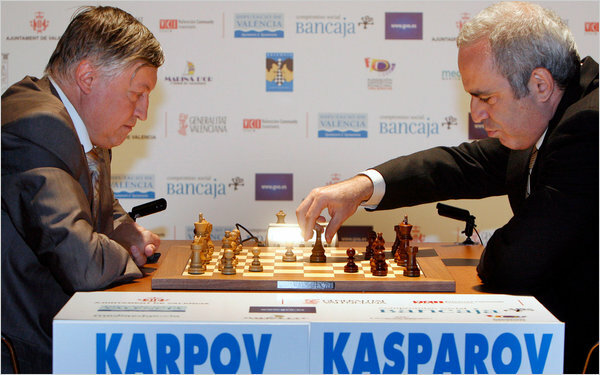 The World Chess Championship 1984 was a match between challenger Garry Kasparov and defending champion Anatoly Karpov. After 5 months and 48 games, the match was eventually abandoned in controversial circumstances with Karpov leading five wins to three (with 40 draws), and replayed in the World Chess Championship 1985. The 1985 World Chess Championship was played between Anatoly Karpov and Garry Kasparov in Moscow from September 3 to November 9, 1985. Kasparov won. The match was played as the best of 24 games. 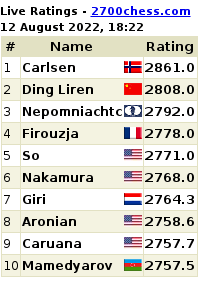 If it ended 12-12, Karpov would retain his title. Click on this link to play through their blitz-games. The link will open in a new window. 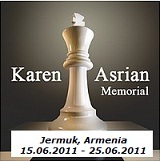 Please click here to play through the games interactively on chessok. 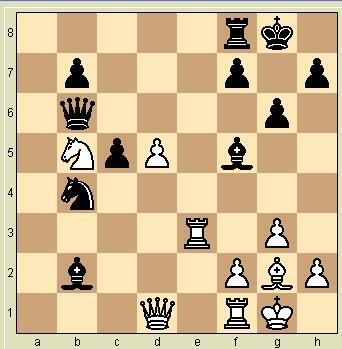 1. d4 Nf6 2. c4 g6 3. g3 Bg7 4. 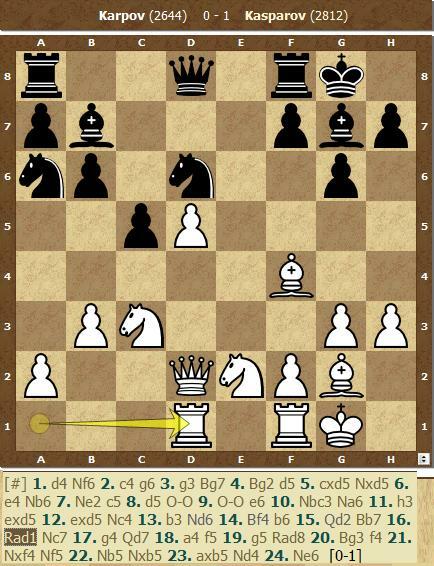 Bg2 d5 5. cxd5 Nxd5 6. e4 Nb6 7. Ne2 c5 8. 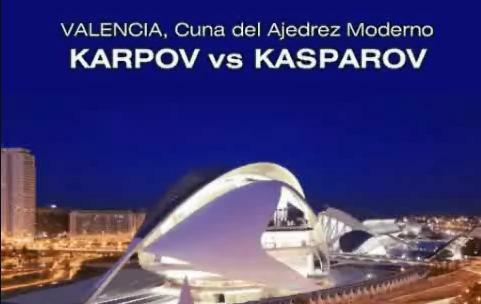 Chess is a game that rarely draws a massive amount of attention from the global public, but a rematch between Kasparov and Karpov reminds us that it throws up the occasional great rivalry. When Garry Kasparov challenged Anatoly Karpov in 1984 for the chess world championship, it was the beginning of a titanic struggle. The contest lasted five months and featured a series of successive draws of 17 and 15 games. 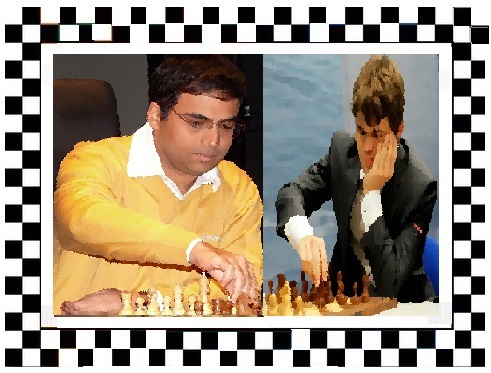 It was controversially ended by the chess authorities over fears for the health of the players, both of whom had lost weight during the struggle. 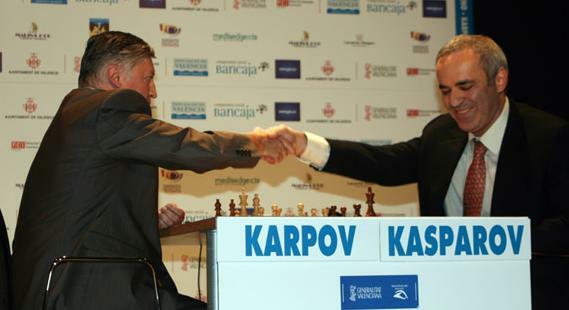 Kasparov had been resurgent at the end, although Karpov still held a lead. 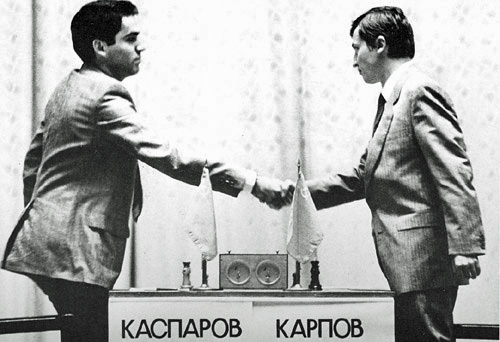 In 1985, Kasparov beat Karpov for the title. 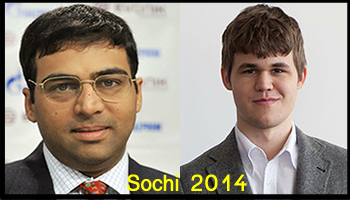 They played for it again in 1986 and again Kasparov won. In 1987, Kasparov was one down going into the final game, but recovered to tie the series and therefore retain his crown. 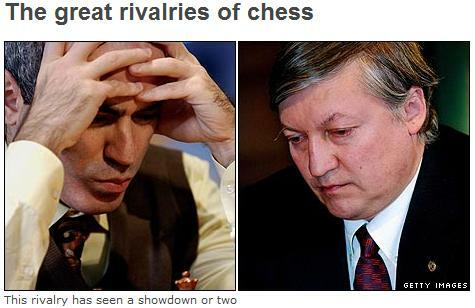 It was a great chess rivalry, but it was more than that to the watching public and pundits. And the rivalry was perfect in pitching a brilliant, brooding outsider against the Soviet establishment’s main man. “Kasparov was a southerner, half-Jewish, half-Armenian, much younger, in the vanguard of a change, taking on the golden boy of the old Soviet Union,” says Keene. Keene organised the London matches of the third series between the players in 1985, which took place both in the UK and Leningrad. He was surprised by the stark disparity between the Soviet and the Western ways of organising things. In London, after the matches, a list of moves with annotation was faxed all over the world within 15 minutes of the conclusion. In Leningrad, a sheet bearing only the moves was typed up, a press officer with a minder was taken to the local party HQ where the only photocopier was to be found, the sheet was copied and then manually handed only to the journalists present at the event. “They were still mired in Soviet bureaucracy and fear of publicity. I thought ‘this place is doomed’. There had been other rivalries that never succeeded in sparking the imagination. Mikhail Tal against Mikhail Botvinnik in the early 1960s had the same hallmarks of the non-Russian outsider against the Soviet stalwart, but failed to develop into a sustained struggle. And the earlier battle between Vasily Smyslov and Botvinnik is probably one for chess aficionados only. 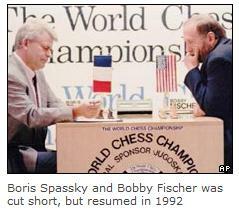 The other rivalry that spread outside the world of chess was between Bobby Fischer and Boris Spassky. Their famous 1972 world championship match became another symbol of the struggle between civilisations. Fischer was the Western maverick up against Spassky, the emblem of the powerful Soviet machine. And Fischer won. “It was about Western individualism, depth of analysis, use of the technology available,” says Keene. And the notion that ideas of a greater struggle would be imposed on chess was an invention of the Stalinist era. He might have approved of the great rivalries with an ideological flavour that grew up in the 1970s and 80s. He would have been less delighted that on both occasions the Soviet establishment’s representative was bested. Other sports have individual rivalries. Tennis has had some great ones. But perhaps only boxing, with its system of champion and challengers, comes close to replicating the way that the protagonists have to study each other’s play and personality, even live in each other’s skin, during the mind-bogglingly detailed preparations for a world championship series. Enjoy the video of the “history” behind Kasparov and Deep Blue of IBM. I like the idea of the music supporting this game of Kasparov! 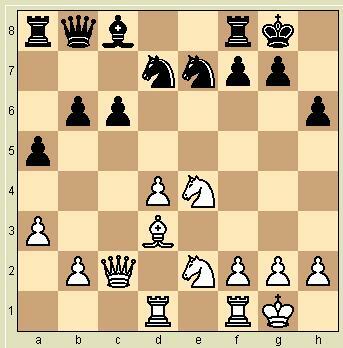 Please Click HERE for a game between Kasparov and Kramnik 1994, Munich. 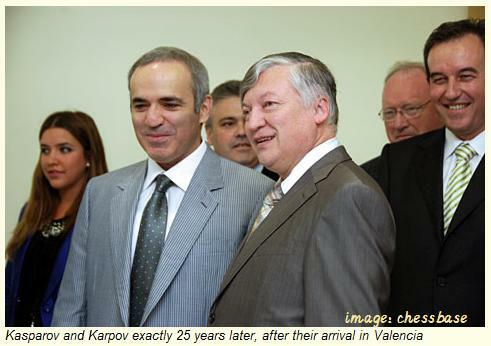 Please click HERE to play through a game of Karpov and Kasparov played in 1985 at the World Chess Championships. If you don’t know about Deep Blue and Kasparov… and IBM’s involvement, then you have a bit of chess catch-up to do! Chess Pieces info on this link! 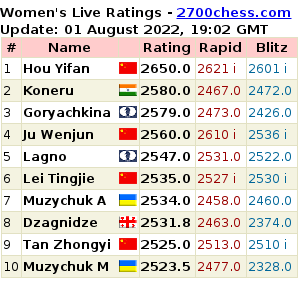 I wonder if I can add no 68?….Chess … the sport with the most books written !! Oxford was the first university to have a chess club, in 1845. As strange as it may seem, Brooke Shields (yes, that Brooke Shields) was a member of the 1990 Chess World Championship organizing committee. The first newspaper chess column appeared in the Liverpool Mercury in 1813. George Koltanowski played 56 consecutive games blindfolded in 1960. He won 50 and drew the other 6. Al Jolson, the first movie actor of the talkies, formed a chess club consisting of radio stars called Knight Riders of the Air. In 1922, Jose Capablanca played 103 opponents at once in Cleveland, drawing 1 game and winning all the rest! The first chessboard with alternating dark and light squares appeared in Europe in the 11th century. Although far from an expert chess player, the exiled Lenin was so preoccupied with correspondence chess that he often rattled on about it in his sleep. 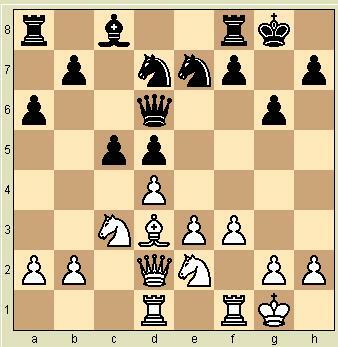 The first chess game played by telephone was played by two gentlemen in Derbyshire, England, in 1878. 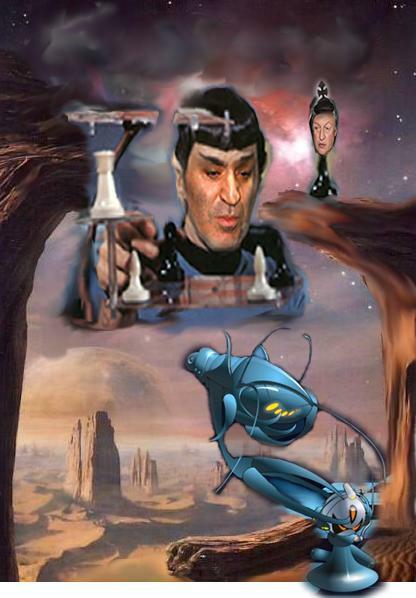 In the television series STAR TREK, Captain Kirk and Mr. Spock played chess 3 times. Kirk won every game. Boris Yeltsin founded the Sverdlosk Chess Club in Russia. 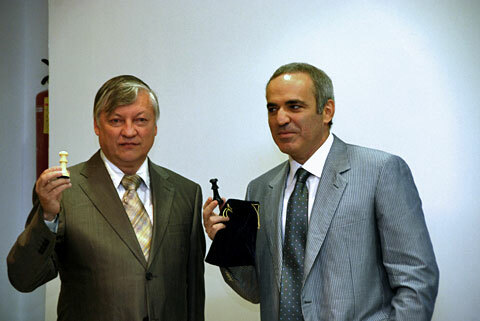 He exhorted his friend Anatoly Karpov to open it. In 1974, Stockholm hosted the first world computer chess championship, won by the Soviet program, Kaissa. The first pocket chess set was created by the author of ROGET’S THESAURUS, Peter Mark Roget in 1845. Surrealist artist Salvador Dali designed a chess set that replaced traditional chessmen with silver fingers and thumbs. When Napoleon died, he willed that his heart be cut out and placed inside a chess table. The first computer program to play proper chess was written at MIT by Alex Bernstein in 1958-59. When Garry Kasparov was 19 years old, he was considered to be the second strongest player in the world. Hungarian Gyorgy Negyesy (1893-1992), who died just short of his 99th birthday, was the longest-lived master chess player. Dr. Emanuel Lasker of Germany held the world chess championship longer than anyone else – 26 years and 337 days. Talk about a bad day! Austrian master Josef Krejcik played 25 games simultaneously in 1910 and lost every one. Chess angel: Kate Jackson, of Charlie’s Angels fame, admitted during a TV interview that she would rather play with her Sargon chess computer than watch TV. Edith Price, proving that one is never too old for a sprightly game of chess, won the British Ladies Championship in 1946 at the age of 76. The largest chess display occurred during the Chess Olympics in Havana: 300 expert players took on 20 opponents each on 6,840 boards. In 1985, Garry Kasparov became the youngest man ever to win the world chess championship, at the age of 22. In 1982, Yugoslav chess journalist Dimitrije Bjelica played in the greatest number of games at one time in Sarajevo: 301. Nine hours later, Bjelica completed the games with a record of +258, =36, -7. Short game: In a match just before he became world champion, Bobby Fischer played I.C4 to open a game against Grandmaster Penno. Penno immediately resigned. 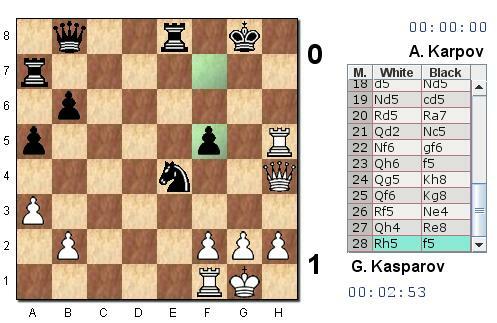 After enduring a mid-game murder attempt in an international tournament in Saltsjobaden, USSR grandmaster David Bronstein went on to win both the game and the tournament. The 1876 Customs Act was instituted in Britain after it was discovered that indecent chess pieces were sent to an all-girls boarding school. Can’t get enough! Vlastimil Hort of Czechoslovakia put on one of the most amazing exhibitions of simultaneous chess ever. He played 550 opponents, 201 simultaneously, and lost only 10 games, all in just over thirty hours in Iceland in April of 1977. Talk about a bad day! A New Jersey player invited 180 opponents to play him in an exhibition in 1977. Only 20 showed up and 18 won. One of his two victories came when he played against his mother. A keen interest in alcohol cost Alexander Alekhine his world championship in 1935. Two years later, he renounced alcohol in favor of milk and won back the championship. Garry Kasparov took part in the first satellite simultaneous exhibition in 1984, playing opponents in both London and New York. In 1988, Kasparov played 10 opponents in Australia, Belgium, Canada, England, Italy, Japan, Senegal, Switzerland, USA, and USSR, winning 8, drawing 1, and losing 1. Janos Flesch played 52 strong players, winning 31 games, drawing 18 and losing 3 over 12 hours – blindfolded! Blindfold chess was forbidden by law in the former Soviet Union because it was considered artistically pointless and harmful to one’s mental health. The first chess tournament on record was held at the Royal Court in Madrid in 1575. 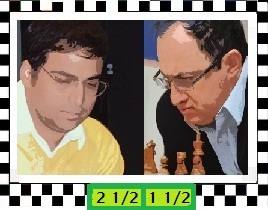 Giulio Polerio and Giovanni Leonardo defeated Ruy Lopez and Alfonso Ceron in a series of matches arranged by King Phillip II. The first chess tournament held in the US was the American Chess Congress, held in New York in 1857 and won by Paul Morphy. The most players ever to compete in one tournament at the master level was 1,251 at the appropriately-named World Open in 1985. The longest game on record took place in Belgrade, Yugoslavia, on February 17, 1989 between Ivan Nikolic and Goran Arsovic. The game took more than 20 hours, with 269 moves made between the two, and it ended in a draw. 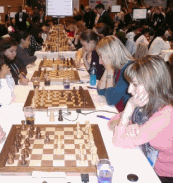 Francisco R. Torres Trois took 2 hours and 20 minutes to make one move in a game against Luis M.C.P. Santos, in Vigo, Spain in 1980. That’s the slowest single move on record. Ironically, he only had two possible moves to consider! Wilhelm Steinitz defeated Johann Hermann Zuckertort in the first world championship of chess, in 1886. Chess was the second sport to have a world championship, after billiards (1873). Wilhelm Steinitz of Austria, and later the US, was the oldest world champion of chess – he was 58 years and 10 days old when he lost the title to Dr. Emanuel Lasker in 1894. Garry Kasparov of the former USSR was 22 years and 210 days old when he beat Anatoly Karpov for the world championship of chess on November 9, 1985, making him the youngest men’s champion in history. However, the youngest world champion of all was Maya Chiburdanidze of the former USSR, who was 17 years old when she won the women’s title in 1978. Anatoly Karpov was awarded the world championship in 1975 when Bobby Fischer refused to appear to defend his title, thereby becoming the first world champion to win the title without playing an actual match. Nona Gaprindashvili of the former USSR was the first woman to achieve men’s international grandmaster status in 1978. She also became the first woman to win a “men’s” chess tournament when she tied for first place at Lone Pine in 1977, and has since had a perfume named after her in Russia. Judit Polgar of Hungary was the youngest person to attain international grandmaster status, at 15 years and 150 days old, on December 20, 1991. Bobby Fischer of the US was 15 years, 6 months, and 1 day old when he became the youngest man to become an international grandmaster. Niaz Murshed of Bangladesh is the youngest person to ever win a national championship, winning the Bangladesh championship at age 12 and later becoming the first (and only) grandmaster from Bangladesh at the age of 20. The first chess magazine, LE PALMEDE, was founded in 1836 by La Bourdonnais. The periodical was named after Palamades, an ancient Greek inventor, who is one of the many fabled creators of chess. 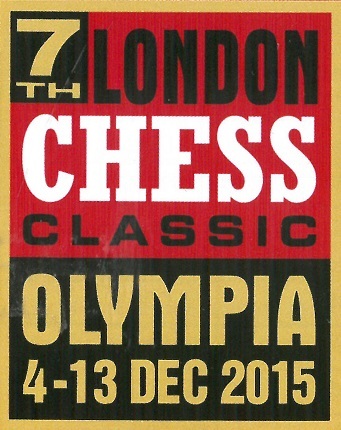 The oldest newspaper chess column still in existence runs in The Illustrated London News, and first appeared in 1842. The first match played by telegraph occurred in 1844 between Washington, DC and Baltimore, using the first American telegraph. The Anderssen-Kolisch match of 1861 was the first match played with a time limit. An hourglass gave each player 2 hours to make 24 moves. In 1902, passengers on the American liner Philadelphia and the Cunard liner Campania 70 miles away in the Atlantic played the first match by radio, transmitting their moves by wireless operators aboard the ships. The match was not concluded, since the radios were needed for navigational use. The USA and USSR played the first international radio chess match on record in 1945, which was also the first international sporting event after the outbreak of World War II. It marked the debut of the USSR in international sport. Never before had a team representing the USSR played another country in any form of sport. Mayor LaGuardia of New York City made the opening move for the US, while Ambassador Averill Harriman officiated the match in Moscow. The first chess game played between space and earth occurred on June 9, 1970. Cosmonauts on the Soyez-9 played their ground crew on a chess set designed specifically for the weightless environment. The game ended in a draw. THE CHESS PLAYERS, painted in 1490, was the first known painting with a chess theme. The first appearance of chess in a film was in THE WISHING RING, in 1914. The first movie about chess was CHESS FEVER, made in Moscow in 1925 and starring Jose Capablanca. BALLET DES ECHECS was the first known ballet with a chess theme performed for Louis XIV of France. GAME AT CHESS, written by Thomas Middleton in 1624, was the first play that featured chess and was performed in England at the Globe Theater. The play was a biting political satire, presenting important statesmen of the day as chess pieces, and it played to packed houses before being shut down due to political pressure. Middleton was arrested and jailed, and the actors were all fined for their participation! CHESS is a 1986 musical written by Tim Rice, the former playwriting partner of Andrew Lloyd Webber, and Benny Andersson and Bjorn Ulvaeus of ABBA fame. CHESS is based on the Fischer – Spassky World Championship match of 1972 and, at the time, was the most expensive play ever put on stage, with a budget of more than $4 million. AUTO DA FE is a 1935 novel written by Elias Canetti, a Nobel Prize winner for Literature, in which the main character is a man named Fischer who wants to be the chess champion of the world. In Stanley Kubrick’s movie 2001, the spaceship Discovery was run by a self-aware computer named HAL, who only wanted to play chess with humans. HAL ended up going mad and attempting to kill the crew of the ship. The first time a chess computer and a person played a game under tournament conditions was at the Massachusetts Amateur Championship in 1967. MacHack VI, created at MIT, didn’t win but still ended up with a 1239 provisional rating. BELLE, a chess program created by Ken Thompson and Joe Condon, has the distinction of becoming the first computer to be awarded the title of US chess master, in 1983. BELLE had previously won the 1980 World Computer Chess Championship. David Strauss holds the dubious distinction of being the first international master to lose to a computer, losing to an experimental Fidelity machine at the 1986 US Open. Dr. Hans Berliner, a former world correspondence champion himself, programmed a chess program named HITECH, which won a Pittsburgh masters’ tournament with a performance rating of over 2400 and the North American computer championship in 1986, and then won the 1988 Pennsylvania State Chess Championship outright after defeating International Master Ed Formanek (2485) in the last round. MOSCOW, Nov. 29 (Xinhua) — Russia’s former world chess champion and the opposition United Civil Front leader, Garry Kasparov, was freed from jail Thursday after being held for five days for organizing an illegal rally. “He was released slightly earlier than we expected,” a member of his movement was quoted by the RIA Novosti news agency as saying. Kasparov was arrested in central Moscow on Saturday while leading a march of opposition group The Other Russia, which comprises the People’s Patriotic Union, led by former premier Mikhail Kasyanov, the banned National Bolshevik Party, headed by writer Eduard Limonov, and Kasparov’s United Civil Front.